Have I mentioned that I’ve been writing a book?? It’s due to be published on March 7th and I’m delighted to have four copies from the publishers to give away. I’m jolly pleased with my first tome. Georgia Vaux, the designer, has done a splendid job with the layout and Short books have included tons of pics of my lovely neighbours. 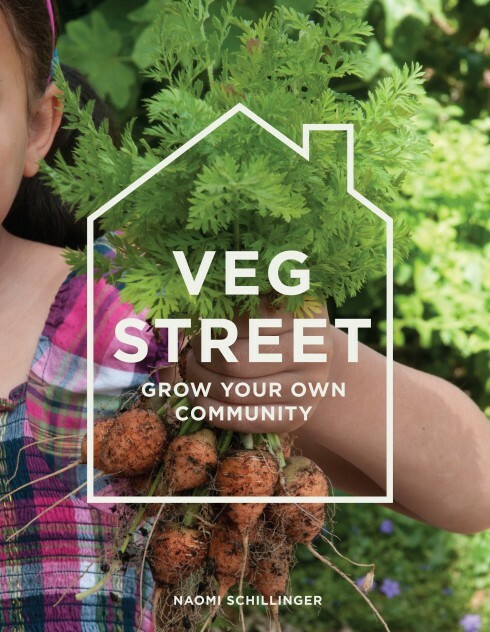 It’s a month by month guide to growing fruit and vegetables (and flowers) in your front garden and in doing so, growing your own community too. inspired by your excellent example I grew tomatoes and runner beans and courgettes in my front garden last year. I loved the way they became a local landmark and kids would stop to see how they were growing. Courgettes were a total no-show so may just try one plant this year but plan to try a pumpkin too, just for the kids. I LOVED growing veg in the front garden. The very odd Chaerophyllum bulbosum that I have no idea what so ever what it might be called in English, beans, beetroot, garlic, sallad, potatoes, carrot, parsnip, sugar-snap peas, radish, chili, pepper, cucumbers, onions and hopefully, if i can find some, Jerusalem artichokes. Great news about the book, congratulations ! I will be growing rhubarb ” pink champagne ” to replace an old green variety and some “Polka ” raspberries. In the veg patch, I am trying some Sarpo Axona potatoes to try and beat the blight, courgettes, squash “Uchi Kuri ” which is delicious , and runner beans Firestorm” . Naomi you dark horse! Cant believe you’re about to launch. Cover looks fantastic so cant wait to read it. We’re really into our rhubarb and herb plot at the moment. I’m growing green beans and dwarf peas (both of which I’ve started off indoors and will plant out in March). I’m also growing broccoli which I love to eat, and can’t buy locally, and some cauliflower, which I have the same story with. The soil in my area is terribly soggy, so I’m afraid to try root veg, as it’s my first year in the garden and I don’t want to demorialise myself. I’m planting some herbs and flowers between my veg to keep some of the pests off. Can’t wait to get out and dig! Hi Naomi! I have fairly recently started blogging and stumbled on your blog by chance. Bizarrely, I think it is your community project that has inspired a project I happen to be leading as part of my town team that we’re calling Brush Up Broadstairs! I am sure your blog and book will be great resources for more inspiration to make it a success! Is also a novice gardener and really hope to have some produce this year, including the staples of potatoes, tomatoes, onions, garlic, strawberries, pears, apples, plums, rhubarb and some salad leaves if I can deter the snails and slugs! Thanks for all the inspiration, both personally and for our community. Congratulations on the book – you must be absolutely thrilled! I’m growing lots of different things but will concentrate on veg that is beautiful as well as tasty – rainbow chard, purple carrots, yellow french beans and my favourite… beetroot! How fantastic! I’m growing Butternut Squash, Beetroot, Fine beans and tomatoes. Hello! I am hoping to grow asparagus peas, and to try some perennial veg such as sea kale, sorrel and some rainbow chard. I also want to try the snake guords for the children to decorate! 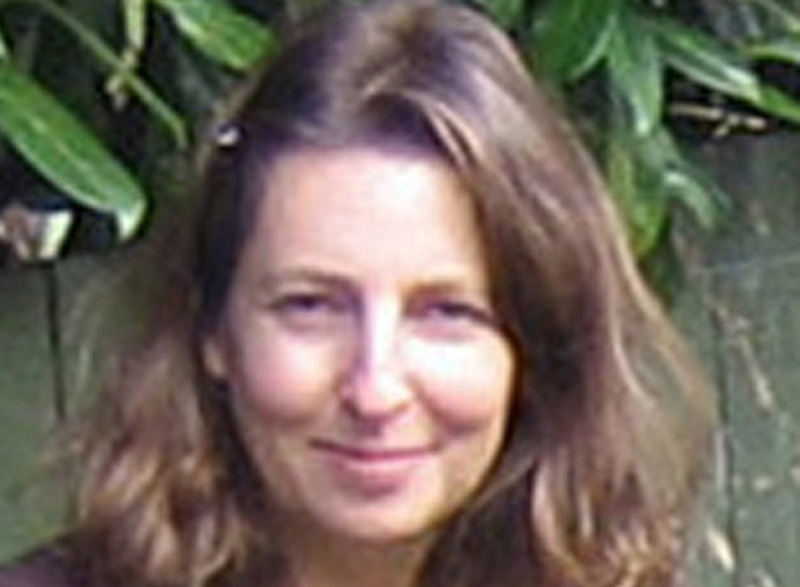 Naomi – I’ve just discovered you’re speaking at the Edible Garden Show and I’m due to be there that day – hurrah! Congrats on the book! This year I’m hoping to move to a larger garden where I’ll have room for more fruit, especially gooseberries, as I want to see what i can do to grow some of the obscure, very large varieties grown by the Victorians. Even if I don’t move, however, I’ll be growing quince, raspberries, strawberries, pears and persimmons (even though mine have yet to develop fully enough to eat any). I always grow parsley, garlic and chives, but it’ll be great to once again have enough sunlight for tomatoes and cucumbers once i move. I’ll live in a shack as long as it is on a good piece of land for growing!! Thi sounds to be a lovely book. I will get it (prize or not) as my mum was part of the original project, and as she has now moved away it will be lovely for her to ‘revisit’ the street in print and pictures. I spent yesterday preparing a bed for 3 new types of raspberries – all autumn fruiting – as my old plants were getting past their best. Will also be growing onions, elephant garlic, beans and all the usual suspects…..
I’d love to be put into the draw for a chance to win one of your books. this year i shallbe growing runner, broad and french beans. Also courgettrs, toms, chilli peppers, strawbs, gooseberries, blueberries and raspberries. Phrw!! oh and salad lesves and herbs!! I would love this book and what a great thing to do. About a year ago I started to write a calendar on my laptop and it sort of turned out to be a book but it is no way finished. I got through the first 6mth of when I first started my plot on 2006 but really I never find the time to get round to finishing it there doesn’t seem to be enough hours in the day. We’re gearing up for the winter veggies in New Zealand too. Right now I’m planting miner’s lettuce and a lot of carrots before I start with the green cover crops like broad beans and mustard. after the deluge of last year, my friend and I have decided to stick to what grew, rather than what got eaten by slugs or drowned by the rain. Therefore plenty of beetroot, turnips, swede and parsnips. Lettuce -funnily enough, after the above sentence- and three times the amount of broad beans that we planted last year! I’m a bit of a novice when it comes to growing so I’ve started with some chilli and coriander seeds on my kitchen windowsill. Hope to get a little more adventurous later in the year. Maybe your book will provide some useful tips! My 7-year old daughter and I have just designed our garden, complete with sunflower house and runner bean teepee! I ‘borrowed’ the ideas from pics I’d seen on pinterest and am extremely excited about growing veg that she can play in! Just need a bit more sun than last year 😉 We’re also relocating our veg patch from the bottom of the garden to an unloved bed near the house, where we’re going to cram in as much as we possibly can – salads, herbs, tomatoes, beetroot. Spuds, garlic and onions will still be in the ‘old’ patch, where I can leave them to be a bit more self-sufficient! I shall be growing in my front garden: asparagus peas, peas, swede, white turnip, romanesco cello,, japanese onions, french beans, spring onions, carrots, spring onions, beetroot, parsnips, purple sprouting broccoli brokali, more onions, leeks, garlic and perennial onions, in containers: mini butternut squash and meteor peas. Hope it’s a good year for everyone!! Congratulations Naomi! It must be hugely satisfying, and having read Wellywoman’s review, I hope your book inspires lots of edible community gardening. Don’t worry about putting my name in the draw, although I am sure I would get lots from your book I will be pretty much gardening alone, so better it goes to someone who might be able to use your tips to get their whole community involved. We started our Moveable Feast Garden in St Leonards on Sea in June last year so this year we are hoping to grow absolutely everything veg-wise this year especially those we were too late for last year. Your book looks great – congratulations. I will be attempting for a second year running to decide which is the best out of 10 different types of squash varieties- I say second year running as last year the slugs ate them all days after planting them out last year apart from one Sweet Dumpling plant which gave me 2 delicious fruit. (Actually thinking about what ive just typed- Im not sure ive quite thought through how much space 10 varieties of squash will take up though!). And provided they dont get covered by rampant curcubits the other new things im trying this year are a Japanese Wineberry (inspired by your post on yours), a Tayberry, some Asparagus Peas, a Cucamelon and some coloured Potatoes which apparently will provide me with mash potato of the most vivid violet and red colouration I bought from the RHS show last week. Hoping to grow as much as possible on my allotment this year Incl. carrots, pots, toms, beans,brassicas,sweet corn as well as different lettuce and salads,Raspberrys. strawberry and other soft fruits,aiming not to have to buy from Supermarkets, alas all our independent s went,thanks to the big 4! congratulations with the book. Sounds a great book, hope I get picked out in the draw! Thanks everyone-it’s really great to hear about what you’re all growing this year from the Moveable Feast in St. Leonards on the south coast to Australia and New Zealand! Glad to hear that last year’s challenging weather hasn’t dampened spirits! Beck- just wanted to say that Dawn Isaac’s Little Green Fingers has some wonderful ideas for children and gardening. Jennie-hope you have great new raspberries and look forward to seeing you and Lily at the next Cake Sunday if you can make it. VP -looking forward to meeting up at the Edible Garden Show-I’ll be talking around lunchtime on Friday 15th March should anyone else be visiting that day! Mummy Sally-looking forward to reading more about ‘Brush up Brodstairs’. Richard-hopefully Mull bound towards the end of May this year-can’t wait! Rosey-lovely to hear how Front garden growing has been so popular with the neighbours-do I hear a project in the making?! Congrats re actually writing a book! WOW! Marmonde, capri and a whole load of seeds (names unknown) collected from nice tasting toms bought in shops. Runner beans (scarlet emperer), pariss island lettuce, king edward potatoes, boltardy beetroot, sturon onions (probably sets again), white lisbon, spring onions, strawberries, (everbearer). Finally, about 3 years ago I planted a seed from a cox’s orange pippin – it is now about 5 ft and I’m hoping to see flowers and maybe an apple or two…you never know your luck! How exciting to see the finished product! You must be delighted. I’m going to be brave and try James Wong’s recommendations (The Garden, March 2013) of chickpea (Cicer arietinum) for sweet pods and chilean guava (Ugni molinae) as much for it’s pretty foliage and scented flowers as for it’s fruit. My front garden was a building site last year and a derelict weed haven before that! Our street has a mix of well loved and totally neglected gardens. Your community work has inspired me to start a plant swap and just get people talking about their gardens as a first step towards tempting them to join together and make a difference. Just by being out in my own front garden working away gives me immediate contact with my neighbours – the number of people who stop and have a chat is so encouraging. The plant that always catches people’s eye is rainbow chard. For camellias – have you visited the camellia garden at West Ham Park? Be prepared for thuggish squirrels but well worth the visit if you’ve got time in the next few weeks. This year I am a little bit late with Veg-planning, but it certainly will be a mix of alredy-tried and completely new cultivars. I just started with Rocket ‘Victoria’, a mix of Salads (Lollo Rossa is my favourite!) and the easy cress to fill the growing gaps 😉 The ‘Pink Fir Apple’ Potatoes are chilling on my windowsill. I have just come winging across from Charlotte’s Plot as her description of your book sounded so inspiring. We’re going to be sharing a plot this year with daugher and son-in-law,so what to grow will have to be the subject of discussion and negotiation,but hoping for sweetcorn, beans and courgettes as well as tomatoes if we can escape the blight. Your book looks ace! I’d love to read it as we are currently digging up our front lawn to make a herb garden in the sun, and plan to relocate our strawberry bags there too, and maybe grow some more successful french beans. I’m hoping it will take the overfed slugs in our shady, soggy back garden a long time to work out where the food has gone. I’m also hoping that working in the front will help us get to know some neighbours – we never seem to see any of them! Tomatoes, courgettes and fine beans for me. I will be growing broad beans, onions (red and white), garlic, potatoes, tomatoes, leeks, beetroot, parsnips, salad crops, raspberries, blackberries, gooseberries, blackcurrants and rhubarb for sure. And extra things that appeal to me as the weeks go by. We dont have a veg plot as such but grow a number of veggies within the garden itself. Tomatoes always do well in pots by the patio for instance. 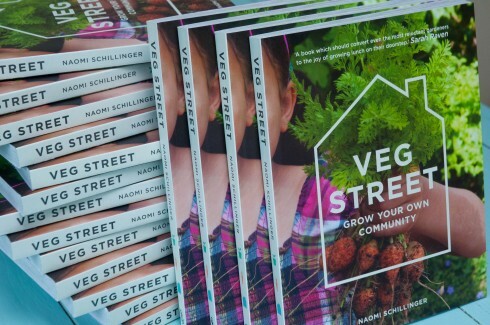 Hi Naomi, I’d love to get my mits on your book as I’m really interested in community gardening and would love to do something similar here in Exeter. I’m growing a whole load of things – broad beans, borlotti beans, pumpkins, oca, tomatoes and leeks to name but a few. Good luck with your book. Congratulations, Naomi! Wonderful to see all that experience of community gardening marshalled into a book. I look forward to seeing it for sale and getting copies for my various gardening friends. Congratulations! That’s so exciting. We’ve just moved into our house in south London and acquired our first ever garden. We’re also now the proud owners of 36 strawberry plants, 6 raspberry canes, 3 Blueberry bushes and innumerable tomato and chilli pepper seeds. Your blog was a huge inspiration to us in making the most of the space that we have, so thank you! I have made the decision to turn my front garden into a vegetable plot this year and am looking for some guideance. This book looks fab! New to your blog, via Charlotte’s Plot – really pleased to have finally found some help from another London-based person in the gardening world, as it’s only my second year of veg growing, so I need all the help I can get! I will be growing potatoes, onions, squash, tomatoes, peas and courgettes. The book looks wonderful! I was thinking of raspberries and strawberries! Oooh, I would love to win a copy of this! This year I am growing runners, toms, courgettes, various salads, carrots, beets, kale… Arrived here via Charlotte’s Plot – it’s so good to find your blog! I have found your blog for the first time today. I am truly inspired. I am completely new to gardening and have decided this is the year I will get cracking in our messy overgrown plot. I dream of growing anything and bringing it to the table. I am setting up a micro bakery from my kitchen and the thought of adding home grown veggies and herbs to breads is an exciting one. I am trying the following, having just got half an allotment in january: carrots, parsnips, onions, peas, french bean, broccoli, cauliflower, jerusalem artichoke, raspberries, strawberries, tomatoes, squash, sweetcorn, potatoes, lettuce, peppers, chard, spinach, celery. I am working on the basis that if I try a few of lots of things then if some fail I won’t be too disappointed, and if some do well, I wont drown in one thing all ready for harvesting at the same time! Good luck with your book – it looks really interesting! I want to grow some perennial vegetables and fruit; jerusalem artichokes are definitely on the list, Hope the book is a big success. Good luck with the book! This year I’ll be growing carrots, parsnips, potatoes, onions, shallots, courgettes, lettuce, french beans, pumpkins, strawberries and hopefully some apples from my new tree. Having just reclaimed our garden from piles of building materials, we hope to get some tomatoes and herbs growing at the very leadt, along with some kind of squash/marrow/cucumber for our toddler to “look after”. A year without homegrown veg has been a long one, and a planting guide would be very useful. I just got some lovely currant bushes and hope for blueberries too. as far as veg goes I have six beds and a greenhouse so I am hoping for loads including purple haze carrots, three kinds of broad beans, Alderman peas, salad potatoes and Black Russian toms. Well done with the book, the cover looks brilliant! ‘Flower Lane’ – to follow later for the next book perhaps? Solanum lycopersicum x 5 var. Such an inspiring project and so excited that it is all captured in a beautiful book. 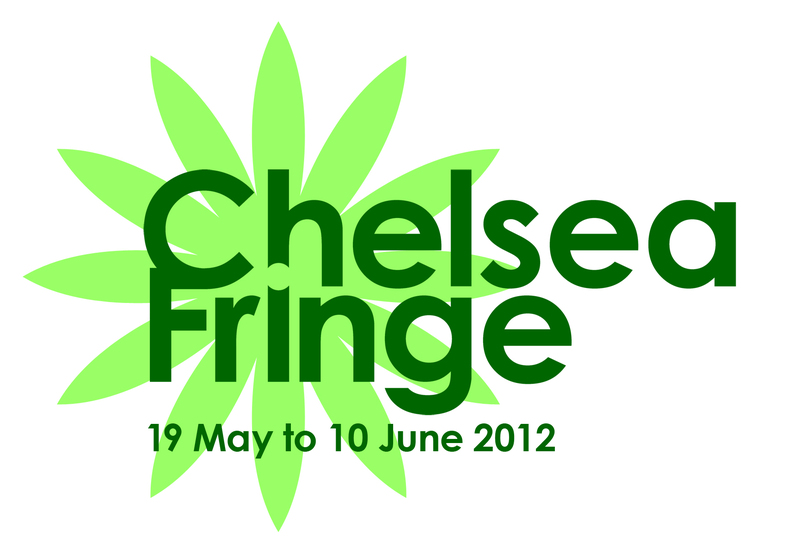 I hope it will help us create a growing project down here in South London. We’re going to start with the simple stuff, courgettes, beans, sweetcorn, beetroot, radishes and maybe some tomatoes. You have inspired us! Your book sleeve looks colourful and interesting: just like my garden this year… I hope! I’ll be growing oriental veg; Pirelli leaves, daikon radish, japanese cucumber, eggplants. European veg: tomato: tiny tims, carrot, beet root, runner beans and strawberries. Of course there will be sweet peas, spring bulbs and summer flowers for lovely colour and attracting the wild life. Now, where’s my deck chair ?